Gov. Tom Wolf kicked off the annual budget season by delivering his $34.1 billion proposal for the 2019-20 fiscal year before a joint session of the General Assembly on Tuesday. In the coming weeks of the budget process, my attention will be on protecting taxpayers from bigger government and higher spending. I have confidence that we will be able to secure Pennsylvania as an economic leader and competitor among states for job and career growth – a place where people want to live, work and play – without further burdening taxpayers or our employers. Our commitment in the Legislature should be to adequately fund the core functions of government – especially public education. I believe we should be educating for success by making sure that any increases in funding reach students and classrooms, not just institutions where costs continue to go up. It’s not just about money, but ensuring our students graduate from school ready to succeed in the workplace and life. We need to escape government dysfunction and start focusing on value for the taxpayers by building our economy through a better tax and regulatory climate. We are equally committed to removing the barriers to employment and self-sufficiency. 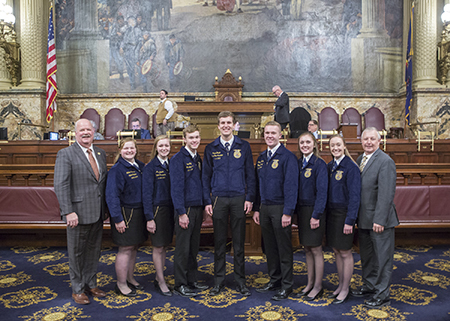 On Monday, it was my pleasure to host the Pennsylvania FFA officers at the Capitol, where they witnessed the unanimous adoption of my House Resolution 45, which I sponsored, designating the week of Feb. 16-23 as “FFA Week” in Pennsylvania. Pictured with me are Millena Bashore, chaplain; Abigail Yoder, treasurer; Sam Loy, reporter; Jacob Kinzer, vice president; Roarke Miller, sentinel; Jenna Harnish, president; Morgan Bear, secretary; and Mike Brammer, executive director. Sam is from Perry County and I’m proud to say he is the 12th state officer since 2004 who has been a constituent of mine. This week, lawmakers passed House Bill 195, which would ensure patients can synchronize their medications in order to receive refills on the same day each month, instead of having to make multiple visits to the pharmacy. Start planning for this year’s fishing season with the Pennsylvania Fish and Boat Commission’s (PFBC) 2019 Trout Stocking Schedule. Copies of the schedules, including a searchable database, can be found online at the PFBC website or the PFBC’s “FishBoatPA” mobile app. A limited number of hard copies of the schedules may also be obtained at my district offices.